Villas in Corfu, Apartments in Corfu, Luxury villas in Corfu, Selected holiday houses in Corfu island! CorfuNorth.Com is offering a selection of finest holiday villas and apartment rentals in unspoilt areas of Corfu island. Our goal is to offer you a vacation proposal in an alternative tourism environment, where visitors have a chance to get away from the usual “complete package” vacation idea and combine a real get away with comfortable accommodation and natural scenery. 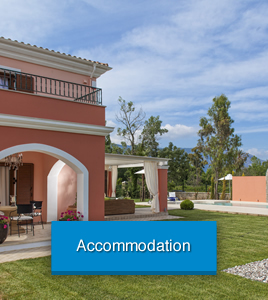 We are located in the northern part of Corfu and we offer a comfortable stay in selected villas, apartments, studios, rooms, which are built with taste and respect to the environment. All areas listed in this site have a common feature: they combine an external natural beauty, the traditional colour and the good infrastructure. The villas, the apartmentsand the small hotels which are listed in our pages are selected with the best criteria, are fully-equipped, with gardens, parking-areas, verandas and a view combing with extraordinary harmony the colours of the Ionian Sea. The services include: general information through fast friendly replies via e-mail, tailor made reservations for holiday apartments, villas in Corfu, rental cars delivered at airport, motorbikes, bicycles, and taxi service. Enjoy the beauty of Corfu Island!